A beautifully finished four bedroom detached family home in the popular residential location of Maidenbower, with excellent transport links and close to local amenities. Upon entering the property, you are greeted with a spacious entrance hallway with ample of space for shoes and coats. There is also access to the cloakroom consisting of a low level WC, wash hand basin, heated towel rail and extractor fan. Opposite, is the living room with wooden flooring throughout. There is also a feature electric fireplace and bay window to front with plenty of space for multiple large double sofas and any free-standing furniture you may wish. Continuing down the hallway, you have some useful under stair storage and access to the beautiful open plan kitchen/diner finished to an extremely high standard. There are numerous wall and base units with built-in fridge/freezer, washing machine, dishwasher, microwave, encased boiler and plenty of workspace with granite work tops and a Rangemaster oven with extractor fan over. This freely leads through to the bright and airy family room with triple aspect windows, vaulted ceiling and French doors to the rear garden. Heading upstairs, there is a good sized landing with access to three bedrooms, the family bathroom and built-in storage. Bedroom four has space for a single bed and any freestanding furniture you may wish with a UPVC window to rear. Bedroom three is a well-proportioned double room with built-in storage and further window to rear. Bedroom two is of a generous size with fitted wardrobes and space for a double bed. There is also a full en-suite with walk-in shower, low level WC, wash hand basin and extractor fan. The family bathroom is fully tiled with P-shaped bath with shower overhead, low level WC and wash hand basin within vanity unit. Heading further upstairs to the top floor landing, there is access to the study room and master bedroom. The master bedroom is extremely spacious with fitted wardrobes, and dual aspect windows to front and rear. There is also a further fully tiled en-suite with a walk-in shower, pedestal wash band basin, low level WC, heated towel rail, extractor fan and opaque Velux window to front. The study is perfect for a home office or games room with ample of space for a desk or other freestanding furniture. Outside the property to the rear is the rear garden mainly laid to lawn with a pathed area for garden furniture. To the front, there is a driveway with space for multiple vehicles and a garage with power and eaves space. 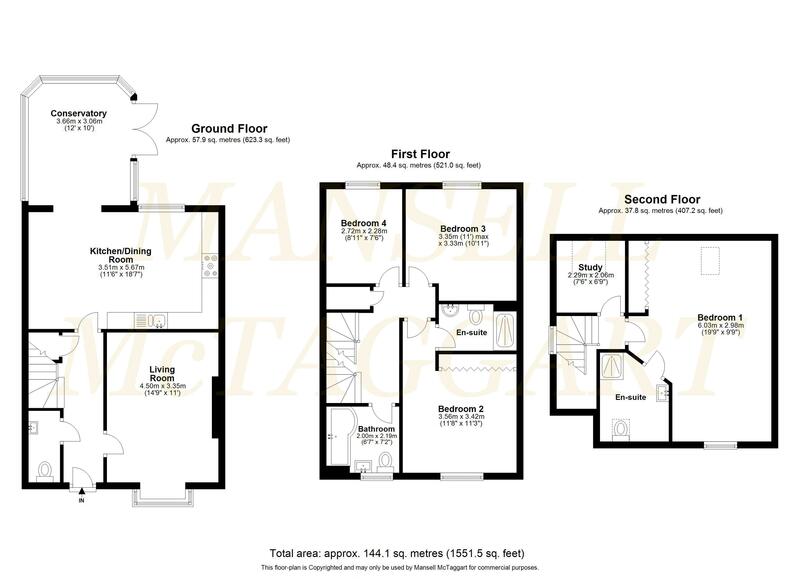 Internal viewings are highly advised to grasp the excellent size and beautiful finish of this property. The property is located in the popular Maidenbower Village and lies within a short walk of the local shopping parade with its selection of convenience stores, restaurants/takeaways and a public house. There are a number of excellent schools within a few minutes walking distance together with a sports centre (HBG Leisure) based at the secondary school, Oriel High. Crawley town centre with its excellent selection of shops, restaurants, recreation facilities and schools. Three Bridges mainline railway station provide fast and frequent services to London (approx. 35 minutes) and Brighton (approx. 30 minutes) is approximately 1.5 miles distance. Gatwick Airport and Junction 10A of the M23 are also within easy reach. Schools The Brook School, Maidenbower Infant and Junior Schools and Oriel High School.